The balls are made From Hardened Chrome Alloy Steel 62 HRC. or Tungsten Carbide and other materials are made on Special Order. Precision balls make a first-rate inspection tool, but loose balls are very hard to work with. This problem is solved by attaching a handle to the ball. Delivery can be made in just a few days. With over 30,000 different lots of special balls in stock, most Ball Plug Gages only require installing a stem and shipping. The heat applied when attaching the stem by soldering, brazing or welding will invariably cause a dramatic change in the size and roundness of the ball, along with a large drop in the hardness. These Ball Plug Gages are produced by an entirely different process which completely avoids these problems: The stem is attached by gluing it into a deep hole that has been produced by Electrical Discharge Machining (EDM). This method holds the ball rigidly without causing any distortion or loss in hardness. Two Ball Plug Gages are frequently used in Go, No-Go combinations mounted on a common handle. All Ball Plug Gages are supplied with handles which meet American Gage Design Standards, unless otherwise specified. Measuring inside diameters, the space between two surfaces and the width of grooves are one of the broadest applications for Ball Plug Gages. 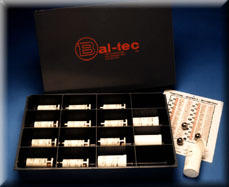 The Ball Plug Gage has a unique advantage over conventional inspection methods. Its spherical shape provides a self-centering line of contact that can be inserted into a hole at any angle. The ball will not stick or bind, allowing it to be used to measure bell mouth and taper. The Ball Plug Gage is excellent for use in confined areas even when the actual hole or groove being measured cannot be seen by the inspector. A feature buried down in a hole or inside a cavity can often be measured by putting a bend in the stem of the Ball Plug Gage. The Ball Plug Gage is at its best when used to measure holes which have a constant diameter but are not straight--Piping and Tubing for instance. A variation of the ball gage concept is to mount the ball on a flexible wire so it can actually go around corners. The ball can be put in the middle of a long wire and pulled in either direction. By machining two flats on the ball, the Ball Plug Gage can be used to actually measure out-of-round holes. 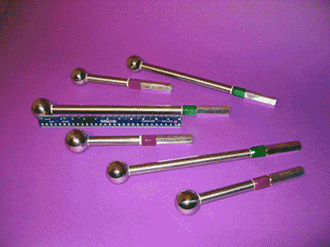 Ball Plug Gages that have two flats on both members are used to gage the inside spherical surfaces of rod end bearings. The precision Ball Plug Gage makes a radius gage of unparalleled accuracy. By applying a thin coat of oil-base Prussian Blue to the Ball Plug Gage, it becomes a very effective method for checking spherical and toroidal surfaces. When the blued ball gage is brought into contact with the test part, it will leave a telltale blue mark at the points of contact. These gages are also widely used to measure the pitch diameter of bearing races, threaded surfaces and of gears. The location of holes, internal and external grooves and various machined details are other common uses for the Ball Plug Gage. During our fifty-plus years in the custom ball business, we have produced a vast array of ball gage designs. Call us for unique configurations that will help you do a better inspection job. An American Gage Design Standard(A.G.D.S.) handle is supplied at no additional cost. "A" - The standard size tolerance for the ball is + .0001" (+.00254 mm). The roundness or sphericity of the ball is 25 millionths of an inch (.000635 mm) maximum. The surface finish of the ball is less than 1.5 microinches (38 NM) Ra. Finer tolerance can be supplied on special order. "B" - The stem length listed is standard, any stem length up to 6" (152.4 mm) will be provided at no additional cost. "C" - The diameter listed is standard, any reasonable diameter will be supplied at no additional cost. (1.3 mm - 12.7 mm) 3.0"
(12.7 mm - 15.09 mm) 3.0"
(15.09 mm - 19.05 mm) 3.0"
(19.05 mm - 25.4mm) 3.0"
A Ball Plug Gage will measure the true cylindrical diameter of any hole. The Ball Plug Gage will measure the cylindrical diameter of a hole absolutely. If the Ball Plug Gage goes through a hole, we know that the hole diameter is at least as large as the ball that passes through it. A lack of cylindrisity does not influence the Ball Plug Gages ability to measure true cylindical diameter. Even if a cylindrical hole is bent or cambered, a ball gage will still faithfully measure the true cylindrical diameter of that hole. "A" - The standard size tolerance for the ball is + .0001" (+ .00254 mm) The roundness or sphericity of the ball is 25 millionths of an inch (.000635 mm) maximum. The surface finish of the ball is less than 1.5 microinches (38 NM) Ra. Finer Tolerance can be supplied on special order. FLAT - The dimension of the flat will be produced to your requirement. The standard tolerance for the flat is + .002" (+ .0508 mm), but a closer tolerance can be held for a small additional charge. An A.G.D.S. ( American Gauge Design Standard ) handle is supplied at no additional cost. "A" - The standard size tolerance for the ball is + .0001" (+ .00254 mm) The roundness or sphericity of the ball is 25 millionths of an inch (.000635 mm) maximum. The surface finish of the ball is less than 1.5 microinches (38 NM) Ra.Finer Tolerance can be supplied on special order. FLAT - The dimension of the flat will be produced to your requirement. The standard tolerance for the flat is + .002" (+ .0508 mm) but a closer tolerance can be held for a small additional charge. (12.7 mm - 19.05 mm) 3.0"
(19.05 mm - 25.4 mm) 3.0"
A Bent Stem Ball Gage is Used to Measure a "Hard To Get To" Internal Cavity. An A.G.D.S. 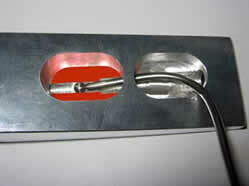 ( American Gage Design Standard ) handle is supplied at no additional cost. "A" - The standard size tolerance for the ball is + .0001" ( + .00254 mm ) The roundness or sphericity of the ball is 25 millionths of an inch (.000635 mm) maximum. The surface finish of the ball is less than 1.5 microinches ( 38 NM ) Ra.Finer Tolerance can be supplied on special order. "B" - The stem length listed is standard, any stem length up to 6" ( 152.4 mm ) will be provided at no additional cost. "D" - The angle of the Bend is held within ±2 degrees standard. Finer tolerance will require a special bid. is the largest variation in diameter found in any one ball from the sample lot inspection. greatest radial distance in any radial plane between a sphere circumscribed around the ball surface and any point on the ball surface. is all those irregularities which form the surface relief but are not deviations of form or waviness. The measurement of this characteristic is to be made with equipment meeting the requirements of and in accordance with Standard ANSI B46.1. is the maximum allowable deviation in any ball mean diameter from the basic diameter ordered. is the difference between the mean diameter of the largest ball and that of the smallest ball in the lot. 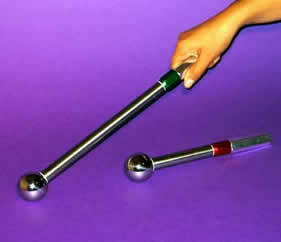 A new form of ball gage is the Balwand™ . This simple straight-forward device is very accurate. It measures the distance or gap between two surfaces. 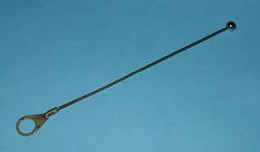 The Balwand™ consists of a long slender shaft or wand attached to a gage ball. The gage ball has at least one flat surface ground on it. This flat is ground parallel to the shaft. In application, the flatted area on the ball is inserted between the two elements to be measured. Unless otherwise stated any ball .300" and smaller will have a flat one third the size of the ball. If the ball size is over .300" the flat will be .100". Attempt to rotate the ball. If the ball turns without sticking, then the space between the parts is greater than or equal to the diameter of the ball. If the ball sticks and won't turn freely, then the distance separating the two parts is less than the diameter of the ball. In practice, one of the two surfaces is often a reference datum such as a surface plate or precisely machined jig. The part to be inspected is separated from the reference datum by precision spacers or machined bosses. The Balwand™ can be used for many tooling and inspection applications including checking the flatness of large parts, the position of cores in mold setting operations, and the final shape of intricate castings or machined parts. By using two Balwands™ of the proper diameters, a GO and NO-GO ball gage can be created. An American Gage Design Standard ( A.G.D.S. ) handle is supplied with each Balwand™ at no additional cost. size of the ball 0.1501" - 0.5"
(3.813 mm - 12.7 mm) 12"
size of the ball 0.5001" - 0.594"
(12.7 mm - 15.09 mm) 12"
size of the ball 0.5941" - 1.0"
(15.09 mm - 25.4 mm) 12"
This inexpensive ball kit contains a wide variety of 98 non standard precision balls. It consists of groups of special ball sizes centered around commonly used fractional inch balls (14 sizes X 7 balls around each size = 98) . These ball sizes reflect the most frequently requested balls for inspection applications. Each group of seven balls contain a standard nominal fractional size ball as well as one each of a +.002", +.001", +.0005", +.0002", and - .001", - .002". The balls are precision lapped to meet the A.F.B.M.A. standard Grade 25. They are spherical within 25 millionths of an inch (635 nm). The surface finish is below 1.5 micro inches (38.1 nm) Ra and the exact ball size is within + or - .0001" of an inch (.00254 mm). The balls are manufactured from chrome alloy steel that is hardened to 62 Rockwell C for wear resistance. This material has a thermal coefficient of expansion equal to 6.3 micro inches per inch per degree Fahrenheit or 11.4 micro meters per meter Centigrade. 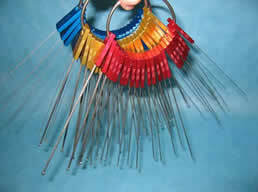 This matches steel gage blocks and is the same as most iron and steel products. This ball kit includes the 14 most popular fractional inch sizes from 3/32" ( 2.381 mm ) to 1.00" to ( 25.4 mm ), see Summary / Prices Page. Each of the 14 fractional groups of balls is packaged together in an individual plastic vial. These plastic vials are housed in a very rugged plastic tray. This tray is placed inside a robust steel shipping and storage case. This large steel case is 12 inches wide by 18 inches long by 3 inches deep. Sapphire Oil is a used as a lubricant when Ball Sizing. For heavy upsets or when a better finish is required, this highly chlorinated oil or wax is the best choice. It is about a forty weight oil that is easily applied to any bore. There are two general designs of flexible ball gages. The first and by far the most common flexible ball gauge is a precise ball of the desired size with a length of piano wire glued into a close fitting hole that has been drilled into the ball by the Electrical Discharge Machining process. The flexible wire can be any desired length. This design will obviously be equally flexible in all directions. This is the least expensive approach. The second design has the gage ball fixed to a thin flat reed of spring steel. The characteristic that sets this design apart is that the position of the ball is extremely flexible in one plane and perfectly rigid in a plane 90 degrees to that. In this way, the ball can be guided between the gap to be measured without any binding. This is a much better design for long flexures. The ball can be attached in several ways. On larger balls the narrow slot can be machined into the ball using a wire E.D.M. machine and the ball is glued on with high strength epoxy glue. An alternative is to drill a hole in the ball and glue it onto a cylindrical pin that is then slotted with the wire E.D.M. machine. Then, this is glued on the flat spring steel reed. We stock flat flexures in ¼ inch (6.4 mm) and ¾ inch (19 mm) widths that are 0.012 inch (0.3 mm) thick. With all of the extra work involved in this design, it is obviously a more expensive product. Producing one of a kind or small quantities of spherical gage tips by conventional machining is a difficult and expensive proposition. Setting up a machine to produce a high quality tiny thread against a shoulder is challenging. It is desirable to have the thread made of a hard stiff material, but machining such a material straight, concentric, and with a good thread forms in a tiny #4-40 or #2-56 thread is an expensive proposition. The solution is simple, and it's inexpensive. By drilling a small concentric hole in a hard steel or tungsten carbide ball by Electrical Discharge Machining (EDM) and gluing in a length of high quality rolled threaded stock, the problem is solved. To further enhance the design, a precision nut is added on the top of the ball. If required, a cylindrical spacer can be inserted between the top of the ball and the nut. The design is quite rugged, as the epoxy glue used in the assembly is a ceramic filled material, with a shear strength of 3000 pounds per square inch. In addition, the axial load developed by screwing the tip onto the gage is applied between the nut and the thread, but not in the glue joint between the ball and the thread. The measuring force is 100% compressive stress, so there is no tendency to pull the assembly apart in every day use. The average cost of a ball gage tip is $63.00. By placing the go and no go ball gage on a common shaft, that is mounted in a single handle, both the speed and accuracy of the gaging process, are dramatically improved. 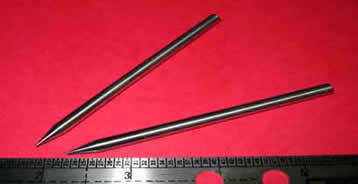 When this technique of placing both Go and No Go gage elements, was tried with cylindrical plug gages on a common handle it was a gross failure. Making this type gage is prohibitarly expensive, because both squareness and concentricity between the two cylindrical elements must be perfect, but perfect is not possible. The two cylindrical elements were ground on common centers, by a cylindrical grinder. So, from the beginning you are limited to the geometry and surface finish of the grinding process. The resulting metallurgy of the ground only cylinders is an amorphous layer of smeared metal, that all but wipes away with the slightest use. (see The story of Super Finishing by [Dr. Swigart). The significant difference with the Gono™ Ball Plug gage is based on the fundamental principal, that there is one and only one point in three dimensional space, that defines the axis of a sphere. For this reason a common axis of rotation will automatically exist between any two spheres regardless of mounting and the axis of alignment between them is only limited by the spherical geometry of the two balls. we need the customer to supply the go and no go ball diameters, the distance between the 2 balls and the overall length of the stem that holds the balls. There is no premium cost for this gage design. The cost is exactly the same as a standard two element Ball Plug Gage. The extra cost of drilling one hole all the way through one ball and producing a custom stem, is off set by the less expensive single ended handle for the gage. Internal threads are a difficult feature to measure. Thread plug gages are expensive and when special pitch diameter gages are required the delivery of the gage can be measured in weeks. Special pitch diameters are required when preparing internal threads for plating, hard anodizing or dry film lubricant and for installing threaded inserts. Precision balls of the same diameter as the best wire size for the thread being measured can be used with cylindrical plug gages to accurately measure the pitch diameter of internal threads. Petroleum jelly can be mixed with the smaller diameter balls to hold them in the pitch diameter of the thread. and anhydrous lanolin can used to hold the larger diameter balls in place. A good number of balls should be applied all the way around the thread. For most common threads the balls used are very small in diameter and quite inexpensive. The evaluation of the pitch diameter is made by inserting a progressively larger series of cylindrical plug gages into the gap between the pitch diameter of the thread and the opposite side of the balls. A point will be reached when one cylindrical plug gage will slip right through the gap but the next larger plug will not even start. Using this method the pitch diameter of quality threads can be determined within .0002 of an inch. This method is a little messy but it is safe, it is inexpensive,it is very accurate, and most of the best wire size balls can be supplied directly from stock. Another excellent application of this technique is to determine the exact positional location of the pitch diameter of a threaded hole. The same basic technique is used but the largest cylindrical plug gage to fit is left protruding from the hole. This cylindrical plug gage will define the true axis of the thread including the squareness. Its position is then determined by a coordinate measuring machine, micrometer, calipers or with a height gage on a surface plate (see Figure 2.). To prevent the cylindrical plug gage from slipping all the way through a threaded hole in the test part, place an "o" ring around the plug gage about 3/8 of an inch (9.53 mm) from the end (see Fig. 2). The balls on this gage set range from 2.0 mm ( 0.07874" ) to 3.4 mm ( 0.1260" ) in increments on 0.1 mm. They are used by an auto manufacturer to check the fit of auto doors. 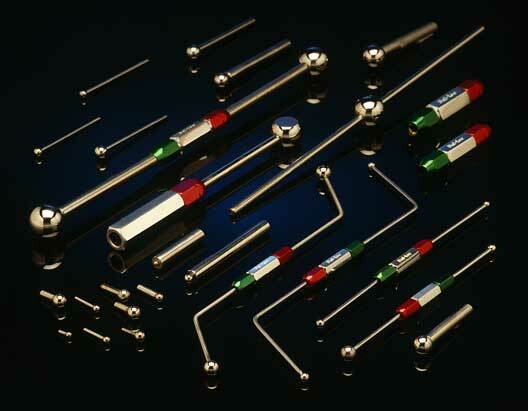 These gages are also referred to as "Gap Gages", "Gap Gauges", "Para-check gages" or "Parallel Checking Ball Gage." Each gage with a stem costs $44.00. If you need a black and white, go-no go system for evaluating the inside diameter of any tubing, try a “SnakeBall”©. By coupling a cable or wire to a very hard alloy steel ball that is precision lapped to the precise minimum diameter of the tube, a go no-go situation is created. To prevent the gage ball from getting stuck somewhere in the tube, there is a coil of wire or cable on each side of the ball that is longer than the length of the tube. Using this approach, the ball can be pulled into the tube; and then pulled back out if the tube if it is undersized or dented somewhere along the path. 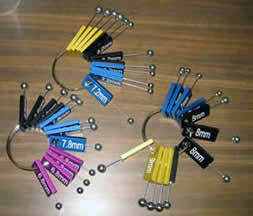 A cable with a colored plastic coating, can be supplied that will identify different diameters of ball. Frequently the no-go gage, will be a simplestandard ball plug gage on an AGS handle. By applying the end of a given spherical tipped probe across a flaw in a machined or ground surface the proportions of individual imperfections can be evaluated. The evaluation is conducted by mechanically scanning across the flaw with a hand held probe. If the spherical tip penetrates the flaw by any appreciable amount, a very evident click will be felt. If the radius of a given spherical tip does not penetrate the flaw, but instead spans it, there will be no noticeable click and the part is acceptable. If the spherical tip drops into a flaw, the probe will move up and down, and a distinct click will be felt. If the spherical tip spans the flaw, no click will be felt. It is of great significance that it is the spherical radius of the test probe that is used, as the sensor element, so that the initial contact surface is only one half the spherical diameter. Then only a small cord of the spherical radius senses the void that constitutes the flaw, so the overall sensitivity of this system is many times greater than might be expected. 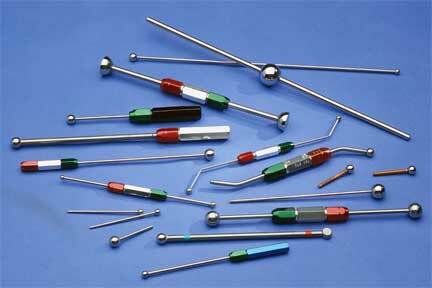 The useful life of these test probes is greatly enhanced by supplying the spheres made with tungsten carbide material. This cermet is very hard with a wear resistance that is 30 times that of hard steel. Because of their small diameter, it is important that the balls be tenaciously attached to the probe handle so they will not be picked off. This attachment is best accomplished by brazing the ball, in place, on the probe tip. Although this task on such small balls would normally be considered impossible, we have mastered the technology to accomplish it. The probe itself is made of highly corrosive resistant metal that can be polished for clean room compatibility. These flaw evaluation tools may be used to test chips, cracks, dents, dings, nicks, scratches, as well as scars, scrapes and chatter. These gages may be used for chip evaluation, crack evaluation, dent evaluation, ding evaluation, gouge evaluation, nick evaluation, indentation evaluation, scar evaluation, scrape evaluation, and shatter evaluation. This technique has been in use since at least the 1940's. This viable and economical non-destructive testing method can detect surface discontinuities and fatigue cracks that the naked human eye is not sensitive enough to see. Early detection of fatigue can prevent costly teardowns. It is much less expensive and better suited to field work than a laser evaluation system. These items are made to order. Price and delivery will be quoted. Today flaw detection went from a bungling art to a traceable science. Previously there had been no traceable artifact to validate the effectiveness of the ball scribe test method. To begin with, the process of tracing a handheld spherical-tipped probe, or scribe, over a surface to evaluate flaws such as cracks, scratches, and other blemishes is inherently subjective. The results of this procedure can vary from one individual to another unless all technicians have been properly trained and their individual sensitivity or feel measured against a standard. Without testing the sensitivity of an individual their performance can be unsatisfactory. We now have a certified test master with which to train individual technicians, and finally we have a method of testing each individual’s ability to actually detect flaws. The Flaw Validation Block consists of two individual pieces of stainless steel that are hardened to 58H.R.C. minimum for long service life. The adjacent faces of these hardened stainless steel pieces are precision-ground and lapped flat within one light band (11.6 microinches). These two precisely finished pieces are separated by a precision spacer, which determines the width of the gap between them. This precise gap is used to simulate the flaw. A small extension of this precision spacer is allowed to protrude out the back side of the artifact, so that traceability of this artifact can be validated periodically. The two pieces are rigidly bonded together by a tie rod that goes through its center. The working surface of the flaw validation block is precision ground and flat lapped to provide a perfectly continuous flat surface to better define the gap. The two piece assembly is then epoxy glued into a base plate. This base plate provides added protection, giving better mechanical stability and provides greater mass. 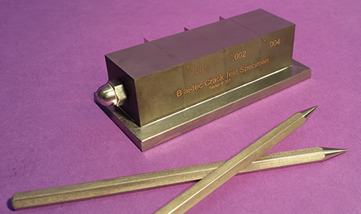 The width of the gap as well an individual serial number are laser engraved on the side face of the Flaw Validation Block. The single element go, no go gage, is an interesting take off on the standard Ball Plug gage. The go ball gage is located on the end of a, rather long, small diameter stem. There is a space and then the no go gage is positioned further down on the same stem. On first thought, you would think that the, no go gage ball , would have to be absolutely concentric to the, go gage ball, or that any eccentricity between them would cause the balls to bind up in the part. This is not the case at all. The center, or axis, of a ball, unlike any other geometry is defined by a single point in three dimensional space. What this means is that the two balls only have to be located, in the ball park and that any small eccentricity will have zero effect on the function of the gage. When a large number of parts must be measured, this little twist can save half of the inspection time. This design is not any more expensive than a simple go, no go ball plug gage. The extra cost of drilling the hole all the way through one ball is made up through savings on the cost of the single handle.